Our people are one of three enablers that assist the group in executing its strategy. They are fundamental to our business sustainability. Recognising our responsibility to the wider employment context, we also employ from, and upskill, the communities surrounding our operations. Following the unavoidable retrenchments at Evander Mines, the group’s total staff complement, including contractors, reduced to 4,840 people (2017: 5,284). An S189A retrenchment agreement was concluded with all affected employees and authorised representatives at Evander Mines following the cessation of Evander Mines’ large-scale underground operations. During the year under review, the group staff turnover was 8.6% (2017: 6.4%), excluding retrenchments. • socio-economic factors, such as the gold price and forex rates impact our operations. We interact with our employees through one-on-one, staff and production meetings, supported by other channels, such as text messaging, emails, print (internal newsletters and posters) and digital (intranet, corporate website and social media). Pan African Resources’ workforce is represented by recognised trade unions and the group complies with all applicable legislation and bargaining arrangements. Each operation has dedicated personnel in place to maintain relationships with unions and employees. As announced on 7 September 2018, Barberton Mines successfully concluded a three-year wage agreement with NUM and UASA. NUM and UASA represent the majority of employees at Barberton Mines. The agreement provides for an average annual wage increase of 6.5% and 5.5% for NUM and UASA members, respectively, over the three years. The negotiations were successfully concluded with no industrial action or work stoppages. The agreement should assist in providing certainty and sustainability to all stakeholders in the coming years. Pan African Resources spent R24.3 million (2017: R32.1 million) on skills development in the current year. Our Barberton Mines and Evander Mines sites have accredited training centres offering occupational skills training, learnerships and bursary programmes. Key performance indicators (KPIs) aligned to group strategic objectives are in place for senior and executive managers. Performance is assessed annually and remuneration linked to KPI scores achieved. 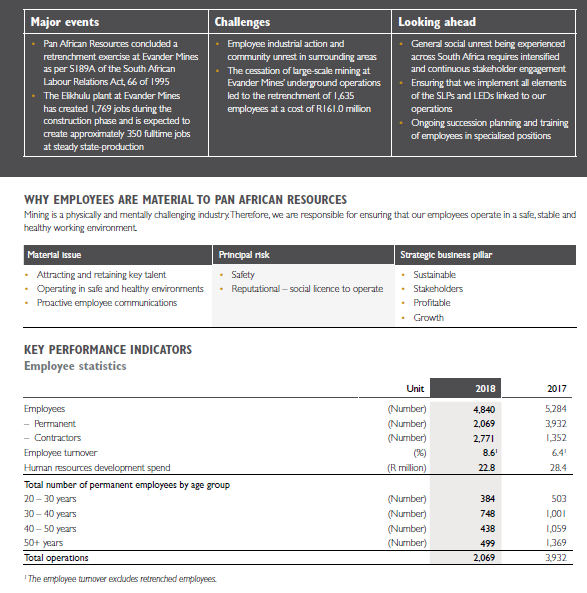 During the 2018 financial year, following the cessation of large-scale mining at Evander Mines’ underground operations, the resultant retrenchment of 1,635 group employees and lower year-on-year group production performance, the executive directors and senior management agreed to forfeit all short-term incentives for the year under review. We regularly interrogate mining industry remuneration practices to ensure our offerings remain market related. Employment packages typically comprise a basic salary and short-term benefits linked to individual job gradings. Remuneration outcomes are measured objectively against predetermined targets. Incentives and share appreciation bonus schemes are designed to retain critical skills and align management focus with shareholder and material stakeholder interests. Employees from a Paterson Grading C level and below are also entitled to a profit share of 1% of the mining operations’ cash flows. Pan African Resources equally considers job applications from disabled South Africans who can fulfil roles being advertised. Should existing employees become disabled, the group will – if practical – provide continuing employment under similar terms and conditions, supported by appropriate skills and development.